Four years after the community submitted all it's disagreements to the Beis Din Zabla in order to bring peace to the kehila, the secular Courts have finally confirmed the Beis Din findings and entered them as binding judgments. The Judge's Decision and Judgment is posted in the tabs above. The Psak Din of the Rosenberg Zabla is confirmed in its entirety, except for paragraph 48 (see Psak Din above) concerning the Vaad HaKashrus. This means that all the findings of the Beis Din Zabla are considered binding by the Courts. The Psak Din of the the Rosenberg Zabla concerning Rabbi Braun is confirmed in its entirety. This means that all the findings of the Beis Din Zabla are considered binding by the Courts: Rabbi Braun's qualifications are proper, his election is proper, and the Beis Din consists of the three Rabbonim, Rabbi Osdoba, Rabbi Schwei and Rabbi Braun. Whatever the majority of the Beis Din decide upon is valid. After the elections, every directive that will be issued by the Rabbinical Court [in writing or verbally] shall be unanimous, and when there are differences of opinion it shall be the majority opinion, and the minority must acquiesce its opinion to the opinion of the majority. The Judge apparently understands the words "the minority must acquiesce its opinion to the majority" as a requirement that Rabbi Osdoba must say or do something to signify his agreement. The Judge said [page 11] that "Rabbi Osdoba ... did not indicate in any manner that he has acquiesced in the majority opinion." While most people would disagree and think these words simply mean that Rabbi Osdoba must accept the opinion of the other Rabbonim when he is in the minority, and abide by the majority decision, the Judge has sent the issue back to the Rosenberg Beis Din to issue their decision about Kashrus. As far as the status of reconvening the Rosenberg Beis Din Zabla, Rabbi Osdoba's group has finally paid its outstanding bill for the prior Din Torah. There is no word about dates for the new deliberations. The Court proceedings today lasted for only a matter of minutes. Judge Rothenberg was told that the Osdoba group did not yet pay the money they owe to the Rosenberg Beis Din Zabla, and, therefore, Rabbi Rosenberg was not willing to discuss dates for further proceedings. The Judge appeared angry and annoyed. She was unwilling to listen to the excuses of Rabbi Osdoba's lawyer. She said she expected to have a date for the Beis Din proceedings, as the Osdoba group had been told to make the necessary financial arrangements, and they had agreed to do so. Since they failed to comply with her order and failed to do what they agreed to do, she said she would now make her decision and would issue it in writing. The Judge noted, however, that, should she receive word that there is a date scheduled for the Beis Din arbitration to proceed, she would consider delaying issuing her ruling until after the Din Torah. The August 21st Court Hearing was scheduled to hear arguments about the validity of the recent appointment of a Vaad HaKashrus (VHK) by the Crown Heights Beis Din and the Vaad HaKohol. [See the tab above on the "PsakDin Court Case - Kashrus Motion 7/4/13.] The Vaad HaKohol is presenting the point of view that the VHK is appointed by the Vaad HaKohol, and reports to them; they are not an independent organization. Rabbi Osdoba's lawyers are tryiing to argue that the VHK is a seperate corporation, and neither the Beis Din nor the Vaad HaKohol have the power to appoint them. The Hearing began on the 21st, lasted the whole day, and continued on the 22nd for the whole day. Because there are a number of motions and Temporary Restraining Orders (TROs) before the Court, the lawyers of both sides will meet with the Judge on the 23rd in order to deal with them. The Hearing will continue listening to testimony from witnesses on September 9th. The first day of hearings began with procedural matters. The Judge discusssed her order for both parties to go back to Rabbi Rosenberg's Beis Din to resolve certain matters, specifically related to Kashrus, which the Judge felt was not clearly resolved in the Psak Din. The Vaad HaKohol's lawyers accused Rabbi Osdoba's side of deliberately delaying and preventing returning to Beis Din by making conditions, and by manufacturing delays. Rabbi Osdoba's lawyer announced that there would be no more delays, they are willing to go to Beis Din without making any conditions, and they would abide by the Psak Din. The Judge said that, should she send the parties back to Rabbi Rosenberg Beis Din, should anyone delay, etc., that side would be ruled against in Court. There were then discussions about which witnesses would be required to testify. The Judge made it clear that all witnesses who were sent a subpoena must appear in Court unless there were extenuating circumstances. There was specific discussion about Rabbi Osdoba, with his lawyers arguing that he should not be made to testify in Court. The Judge ruled that he must come. A discussion took place about which side would present their case first, and it was ruled that, since Rabbi Osdoba's lawyers had requested the hearing to determine the validity of the new VHK, they would make their case first. They called Beryl Levertov as their first witness. He testified that he is in charge of the VHK, that he has been so for many years, and that he determines which hechserim he gives. He reported that Rabbi Osdoba's role on the VHK is very limited, essentially to answering halachic questions that may arise that Levertov brings him. The Vaad HaKohol's lawyers then began their cross-examination, which continued until the end of the day, and was adjourned to be continued the next day, August 22. The questioning concerned who Levertov reported to, trying to make it clear that the Vaad HaKohol, and the Rabbonim on the Beis Din, controlled the VHK. On April 22nd, Levertov's testimony was interrupted to allow one of the Vaad HaKohol' witnesses, Rabbi Spielman to testify, (because he had to leave early to attend his granddaughter's wedding). Levertov then continued his testimony. After Levertov's questioning was finished, the Osdoba lawyers called their second witness, Yanki Herzog. Although the Osdoba lawyer's called Herzog, he is known as a "hostile witness" since he favors the Vaad HaKohol's point of view. He is still in the middle of his testimony, and will resume at the next hearing date on September 9. Both Rabbi Spielman and Yanki Herzog testified that the Vaad HaKashrus is formed by, and reports to, the Vaad HaKohol for administrative matters, and is supevised by the Crown Heights Beis Din regarding questions of Jewish law. Judge Rothenberg ordered both parties back to Rabbi Rosenberg's Beis Din within 90 days for a continuation of the Din Torah. She requested documentation from Rabbi Rosenberg by October 12th that Rabbi Osdoba's side has agreed to all the conditions he set, and that payment arrangements are made. No more witnesses will be called and no more testimony will be taken for now. The hearing on September 9 will continue the lawyers' battles on the outstanding motions, including the motions each side has against the other for contempt of court and sanctions. 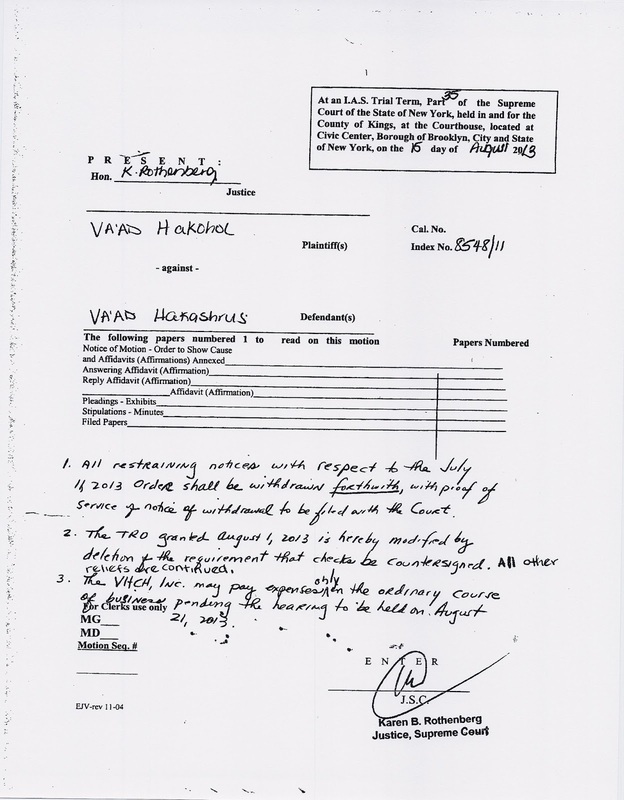 The Levertov Vaad HaKashrus can continue operations in the meantime, however, they must send a copy of each check that they write to the new Vaad HaKohol's Vaad HaKashrus, and the Judge wants to see a weekly report of their financial activity. that it is under the supervision of the Crown Heights Beis Din, is false and amounts to consumer fraud. She strongly recommended that it be removed from the CHK symbol immediately. All restraining notices with respect to the ﻿July 11, 2013 Order shall be withdrawn forthwith, with proof of service of notice of withdrawal to be filed with the Court. The TRO [Temporary Restraining Order] granted August 1, 2013 is hereby modified by deletion of the requirement that checks be countersigned. All other reliefs are continued. The VHCH, Inc. may pay expenses only in the ordinary course of business pending the hearing to be held on August 21, 2013. To understand the significance of this, a brief review is in order. This Court Case has been dragging on for several years. It is about confirming the Psak Din of the Rosenberg Beis Din Zabla in the Courts, so that the Court can enforce the decisions of the Beis Din. When the original motion to confirm the Psak Din was made, the request to enforce the psak that Kashrus is administratively under the Vaad HaKohol was specified as part of the case. This would mean that Rabbi Osdoba would have to transfer control of Kashrus to the Vaad HaKohol, and that the other Rabbonim, Rabbi Schwei and Rabbi Braun, would be involved in the kosher supervision. Rabbi Osdoba's lawyers have fought to prevent the transfer of Kashrus and the recording of the Psak Din in the Courts. The Judge has, since June of 2012, ordered that everyone go back to Beis Din to clarify what the Psak Din says about the Vaad HaKashrus and related matters. After much delay, apparently by the Rabbi Osdoba side, the Vaad HaKohol formed a new Vaad HaKashrus that was accepted by the majority of the Beis Din (it was accepted by Rabbi Schwei and Rabbi Braun). This new Vaad HaKashrus was presented to the Court with a request that the Court give them control of the CHK. [T]he Osdoba respondents shall deposit forthwith, with the Court all reserve and/or monies received or held by Va'ad Hakashrus entities and/or their [unreadable] (Vaad Hakashrus of Crown Heights, Corp., Vaad Hakashrus of Crown Heights, Inc., Vaad Hakashrus Crown Heights, Inc., and Vaad Hakashrus of Crown Heights, pending further orders of this Court. A Court date was set for August 21st to hear Rabbi Osdoba's lawyers objections to the new Vaad HaKashrus. 8. On August 5th, the new Vaad HaKashrus sent out letters (Restraining Orders) to the suppliers and merchants that use the CHK hechsher, and told them not to pay the old Vaad HaKashrus, and that the new Vaad Hakashrus was in charge. Order the new Vaad HaKashrus to send out letters to the suppliers and merchants retracting their Restraining Orders. Remove the requirement that the new Vaad HaKashrus has to co-sign checks with the old Vaad Hakashrus. Maintain the requirement that the old Vaad Hakashrus cannot do anything more than pay expenses of the ordinary business, and cannot transfer money, hold themselves to be the Directors of the Vaad HaKashrus, etc. That on August 21st, the Court Hearing to determine the validity of the new Vaad HaKashrus. will be held. Note that Judge Rothenberg did not grant the Motion of Contempt of Court. The Court's Order of July 11 discussed in our previous post has been modified in order to allow the CHK to continue to function and pay its bills. The requirement to deposit the money with the Court has been changed, and the current Vaad HaKashrus, (for the sake of clarity we will call it the Levertov Vaad HaKashrus) can continue to receive money from its clients and to pay its bills. The Levertov Vaad HaKashrus cannot hold themselves to be the directors of the Vaad HaKashrus, and they cannot receive pay. This includes Rabbi Osdoba and his two sons, as well as Rabbi Segal and Beryl Levertov. All checks written will be signed by the Levertov Vaad HaKashrus, but will require a co-signature from one of the members of the Vaad HaKohol's Vaad HaKashrus. The Vaad Hakohol presented a settlement agreement that appointed a new Vaad HaKashrus that will run the CHK hechsher along with all the Rabbonim of the Beis Din. This settlement agreement was co-signed by a majority of the Rabbonim of the Beis Din (Rabbi Schwei and Rabbi Braun). The Judge heard oral arguments and set a date of August 21, 2013 to have a hearing on the settlement agreement that the Vaad Hakohol submitted. In the meantime, all money belonging to Rabbi Osdoba's Vaad HaKashrus, together with all proceeds of the CHK hechsher, must be turned over to the Court immediately, pending the Court's final decision. The oral application the the Responsent's represented by Seidemann & Mermelstein, and the Abramson Law Group, PLLC ("The Osdoba Respondents") for an evidentiary hearing on the authenticity of the Kashrus Settlement Agreement dated June 4, 2013 is granted, and the hearing shall be held on August 21, 2013 at 11:00 a.m. Furthermore, the Osdoba respondents shall deposit forthwith, with the Court all reserve and/or monies received or held by Va'ad Hakashrus entities and/or their [unreadable] (Vaad Hakashrus of Crown Heights, Corp., Vaad Hakashrus of Crown Heights, Inc., Vaad Hakashrus Crown Heights, Inc., and Vaad Hakashrus of Crown Heights, pending further orders of this Court. In response to several questions from readers asking for an update and other questions about the Psak Din Court Case, we have updated the tab above "Psak Din Court Case - Summary and Documents" with more documents and an explanatory summary. We hope this will answer the questions we have received. We are grateful to our readers for their feedback. Analysis of the Pashkvil "From Under the Desk of the Badatz"
We are presenting here some answers to the recent pashkvil that was disseminated as part of the series of personal attacks on Rabbi Braun called “From Under the Desk of the Badatz”. The pashkvil is full of such outright, and easily disproven, lies, distortions, and calumnies, that it should require no response. Yet, based on the principle that “the bigger the lie, the more some people believe it”, it would seem in order to point out its deceptions clearly. Most of the issues it raises are clearly shown as lies by simply referring to the documents already on the site. It should be pointed out that many people feel it is common knowledge who the author of the pashkvil is, and that he is a signatory on the Shtar Birurin. If so, he would appear to be “m'sarev the Beis Din," for this pashkvil, as well as many more matters. Rabbi Braun does not have shimush. There was no letter of recommendation. He did not meet the age requirement. He left his position in Sydney against the Rebbe's instructions. Answer: All these objections were made to the Rosenberg Beis Din Zabla. All five Rabbonim heard the issues and discussed the case. All parties agreed to be bound by the decision of the Rabbonim and signed on the Shtar Birurin which can be found in the tabs on top of the screen. The Psak Din is also found in the tabs on top of the screen. In brief, it says that Rabbi Braun's semicha is valid, and that he was properly elected. Furthermore, all the Rabbonim must serve with him, and the kehilla is obligated to give him the proper kovod as Rav. Rabbi Heller was thrown off the Beis Din. It is interesting to read this section of the pashkvil, as it says nothing. Who exactly is being accused of throwing out Rabbi Heller? How? Answer: It is well known that Rabbi Heller resigned from the Beis Din many years ago, [as is even recounted in the pashkvil in the prior section!] and, despite many attempts to bring him back, including just before the elections, he refused. Furthermore, anyone can ask him directly, and Rabbi Heller will tell them this. III. Rabbi Zinner's letter of semicha was forged, and Rabbi Zinner confirmed this. This section also accused Rabbi Rosenberg somehow of complicity in fraud, as well as that the psak din confirming the semicha was only from Rabbi Rosenberg. Answer: This is the same answer as point I. Above. The complete Psak Din is in the tab at the top of the screen. It should also be noted that continuing to make these charges after the psak din was issued, and in light of signing the Shtar Birurin, amounts to being in the category of mesariv the Beis Din. It should also be noted, that when Rabbi Zinner was asked about Rabbi Braun's expertise in Torah and ability to rule on Torah law, he answered “Maybe better than me.” Anyone can verify Rabbi Zinner's opinion of Rabbi Braun's qualifications by asking him directly. However, when Rabbi Zinner was put under tremendous pressure by certain elements in the community, he asked that the Semicha that he gave not be used to contribute to machlokis in the community. This issue was adjudicated by the Beis Din Zabla (see the Psak Din above) and it was ruled that the semicha is valid. Rabbi Rosenberg resigned from the Beis Din Zabla, and “members of the community” had the right to go to a different Beis Din. Specifically, they were allowed to call Rabbi Braun to the Beis Din of Rabbi Kraus. Answer: Rabbi Rosenberg did not resign, on the contrary, he committed himself to continuing the Din Torah. However, he made several conditions. First, he wanted everyone to be present in person, (not to hold hearings on the phone,) all the Rabbonim and both sides. Second, he wanted all parties to agree to come, not that hazmonos would need to be issued. Third, all issues that either side wanted to bring up would be heard and rulings issued. In fact, a date in mid-August was agreed to by all parties. This means that there is an ongoing Beis Din that is in the midst of adjudicating all issues and that both parties accepted their authority. Obviously, any claims to the contrary are false, and no other Beis Din can interfere, and certainly not issue binding hazmonos or rulings. Rabbi Braun, after Rabbi Rosenberg allegedly resigned from the Beis Din, served Rabbi Osdoba with a lawsuit. The motion to record the Rosenberg Beis Din findings in the Courts, which the Beis Din explicitly specified, and which Rabbi Osdoba is fighting in the Courts. See the tabs above. A lawsuit that Rabbi Osdoba filed against Rabbi Braun. See the tabs above. In light of the recent pashkvil attacking Rabbi Braun, we are here reprinting the summary of the Psak Din of the Rosenberg Beis Din Zabla concerning the validity of Rabbi Braun's semicha. The entire Psak Din can be found in the tab at the top of the page. (a) There was insufficient time between the announcement of Rabbi Joseph Shaya Braun's candidacy and the elections; this prevented people from conducting necessary clarifications. (b) Rabbi Braun does not have a Yadin Yadin semicha. (c) He also does not have a Yoreh Yoreh semicha. A ruling of the Rebbe of Lubavitch zt"l forbids a rabbi from leaving his congregation and receiving a rabbinical position in another congregation. In our opinion, the first objection has no real halachic basis and cannot invalidate the elections. When the original elections for the Beis Din were held, of the three elected Rabbis, two of them had only Yorah Yorah semichos, and did not have Yadin Yadin semicha. This proves that a Yoreh Yoreh semicha is sufficient. The semicha received by Rabbi Gavriel Zinner is a kosher semicha. This determination was made after speaking with Rabbi Zinner, and after examining many letters that he sent to prominent Chabad Chassidim. It is clear that he did indeed sign the semicha and that it is not forged. Therefore this remains an absolute semicha. Regarding his claim that because the appointment of Rabbi Braun is not acceptable to everyone, and he does not want to be part of, or contribute to the controversy, so he does not want this semicha to be used to qualify Rabbi Braun, It is obvious that someone who grants semicha has no power or authority over the ordained person to instruct him which rabbinical position he may accept and which he may not. Even if he thinks that the ordained person should not receive a certain rabbinical position, the ordained person is not obligated to heed him and the semicha is not invalidated by not heeding him. Actually, after-the election, when Rabbi Yosef Shaya Braun, shlita, heard of the objections against the semicha, he received two more semichos,'one, a YorehYoreh semicha, and another, a Yadin Yadin semicha. We do not need to consider these semichos, because the first semicha that was received before the election is absolutely valid. The issue of leaving one place for another is dealt with in a letter from the Rebbe,who clearly says that an analysis of the benefits and loss occasioned by the change must be made by the receiver of the position, not by the Beis Din. In light of the above, it is clear that Rabbi Yosef Shaya Braun shlita was elected in accordance with halacha. The entire public must honor him and all the other rabbis of the community must cooperate with him,etc., etc. In our post below on May 22, 2013, the Beis Din Advisory referred to the law suit filed by Rabbi Osdoba. We have obtained the details of the lawsuit and present them now. Rabbi Osdoba filed a personal lawsuit against Rabbi Braun on April 24, 2013 in the secular court system. He claims heter from Rabbi Chaim Kraus. The letter claims that Rabbi Braun ignored three hazmonohs, but this is in dispute. Besides the problematic nature of going to secular court, and besides the request that the secular court rule on issues of Jewish law, it would also appear that the prior agreement to go to Rabbi Rosenberg's Bais Din Zabla this coming August, would invalidate the Kraus actions. The Osdoba documents are contained in the tab on top of the page above. The lawsuit requests the Courts to rule that Rabbi Braun be invalidated to be on the Crown Heights Beth Din, and that he cannot give kosher certifications, nor claim the present CHK kashrus certifications are invalid. It also seeks punitive monetary damages. a Rabbi sitting on the Crown Heights Beth Din be found void ab initio. assessing punitive damages against Braun.